In addition to giving cash directly to FMSC, there are other simple and easy ways to support Feed My Starving Children in your everyday life. Some cost you nothing - all are convenient. Many even have tax benefits! 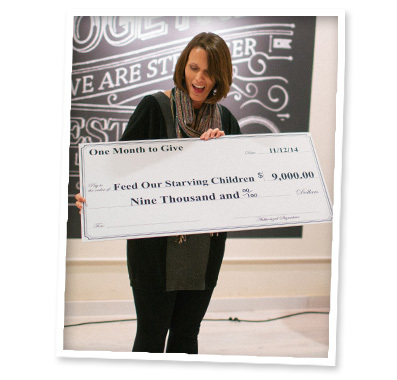 Your generous financial support feeds desperately hungry kids around the world. Since each meal costs less than 25 cents to make, your gift goes a long way in the fight against world hunger. FMSC's Tax ID is 41-1601449. Need to choose a charity for your payroll giving program? We qualify! Your employer may even match your gift. We are part of the Global Impact alliance of charities! Direct your payroll deductions to Feed My Starving Children within the Global Impact group in your employee giving campaign. Your employer may double or even triple your donation with a matching gift! Donate real estate, retirement assets, cash, insurance, stocks or bonds. Enjoy tax and income benefits while giving hope to hungry children. A gift of stock allows you to avoid capital gains tax and still claim a deduction of the stock's value on the date it is donated. View FMSC's stock account information and complete FMSC's online stock transfer form. You must complete this form if you would like to receive a tax receipt for your donation. For further questions on stock donations, please contact development@fmsc.org or 763-504-5230. Would you like a tax benefit and a way to help Feed My Starving Children? Donate any car, truck, RV, or boat. If you own a Thrivent Financial plan, you can direct your "Thrivent Choice dollars" to FMSC. If you have Thrivent Financial products, you are eligible to lead a Thrivent Action Team in a one-time fundraiser, service activity or educational event. You will receive a $250 Community Impact Card to use as seed money to apply toward your project. Amazon donates 0.5% of the price of your eligible AmazonSmile purchases to the charitable organization of your choice. Select Feed My Starving Children to be the recipient of your purchases.